This project is based on Hussain Chowk which comes under the umbrella of one of the biggest commercial hubs of Lahore, Gulberg. Many of the Best Architects in Lahore have graced the urban fabric of this area with their esteemed works, including our Architecture Firm, Archicubes. The clients of this commercial project were looking for a transformation in the existing design of this building. It was an already constructed plaza, designed on contemporary lines. 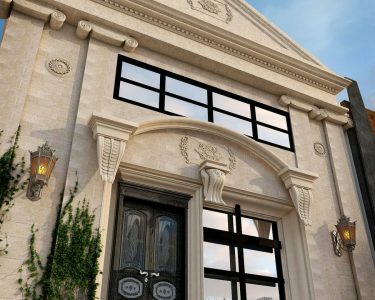 The client wanted to change up the facade of the building, replacing the modern elevation with a classical design. 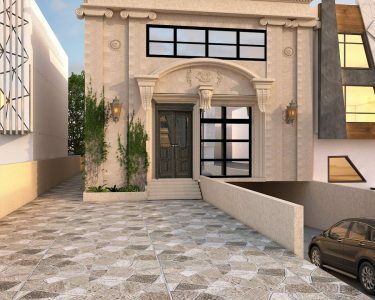 Since classical architecture inspired designs are on a rise in Lahore in recent times, every Architect Design Firm is trying their hands on this technique. Classical architecture derives its fundamentals from Greek and Roman art. Some of the major elements of this particular design style include, ornamented pediment, beak moulded arches, columns of five orders namely; Ionic, Doric, Corinthian, Composite, Tuscan) and many other details such as the entablature, cornice and modillions. For this design we chose to incorporate a triangular pediment with cornice details, sitting on rectangular columns with ionic volutes in the capital. Below that we have an arched entrance, ornamented with complex leafy modillions hanging from a string course. A wooden door heavily embellished with glass and metal details add up to the grandeur of the building entrance. Incorporated into these classical details, we have contemporary windows designed on purely basic lines. A primary black steel framed window, devoid of any complexities, creates an eye-catching contrast with the ivory surface of the building. This blend of basic and extraordinary is implemented in a way which creates a harmonious dialogue between the two design languages. The final product is an elegant facade to a commercial building, which responds to the highly well developed vicinity of the city. Remaining finishes are added to the design using creeper vegetation which again creates an interesting contrast with the ivory building. In the end, it is a humble attempt at classical architecture style, which has a very significant never-dying value in history.